Hours of Operation: Wednesday through Sunday, 10 a.m. to 5 p.m. 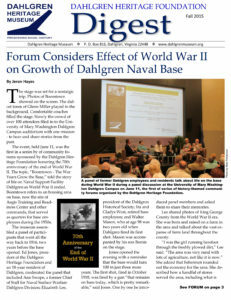 The Dahlgren Heritage Foundation opened a new museum in King George County, Virginia, in October 2013, that serves as a center for community education, recreation, unique exhibits and stunning naval artifacts. Through the efforts of many volunteers, this exciting project is off to a great start, and there are many ways that you can become involved. Using this website you can send us your comments and ideas, volunteer to help out, make an online donation, learn about upcoming museum events, become a member of the museum or sign up to receive updates through our email newsletter. If you would like to bring your group or organization to the museum on hours not listed above please send us an email and we can make arrangements. 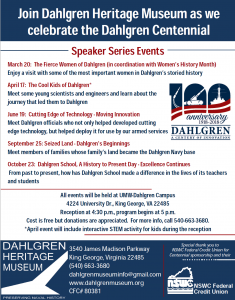 Become a museum member and help us share the amazing stories of Dahlgren and King George County that have helped shape our nation and inspire our future. 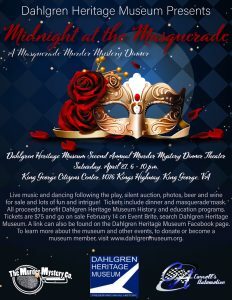 To learn more about the museum and other events, to donate or become a museum member, visit www.dahlgrenmuseum.org. Reception at 4:30 p.m., program begins at 5 p.m. Cost is free but donations are appreciated. For more info, call 540-663-3680. The Dahlgren Heritage Foundation is now a participating charity in the AmazonSmile program, which offers Amazon customers a simple and automatic way to support their favorite charity every time they shop, at no cost to customers. Amazon customers shopping at smile.amazon.com will find the same low prices, vast selection and convenient shopping experience as Amazon.com, with the added bonus that Amazon will donate a portion of the purchase price to a customer’s favorite charitable organization. To shop at AmazonSmile simply go to smile.amazon.com. Tens of millions of products on AmazonSmile are eligible for donations. Shoppers will see eligible products marked “Eligible for AmazonSmile donation” on their product detail pages. Shoppers can use their existing account on Amazon.com and AmazonSmile. A customer’s shopping cart, Wish List and other account settings are also the same. On their first visit to AmazonSmile, customers will need to select a charitable organization to receive donations from eligible purchases before they begin shopping. Customers’ selections are remembered, and then every eligible purchase made on AmazonSmile will result in a donation.